Looking at a Roman site and up pops a Lower/Middle Paleolithic hand axe. When I said archaeology had to take a back seat, what I really meant was that archaeology had to take a back seat from being all consuming. The problem is the more you look, the more you find. 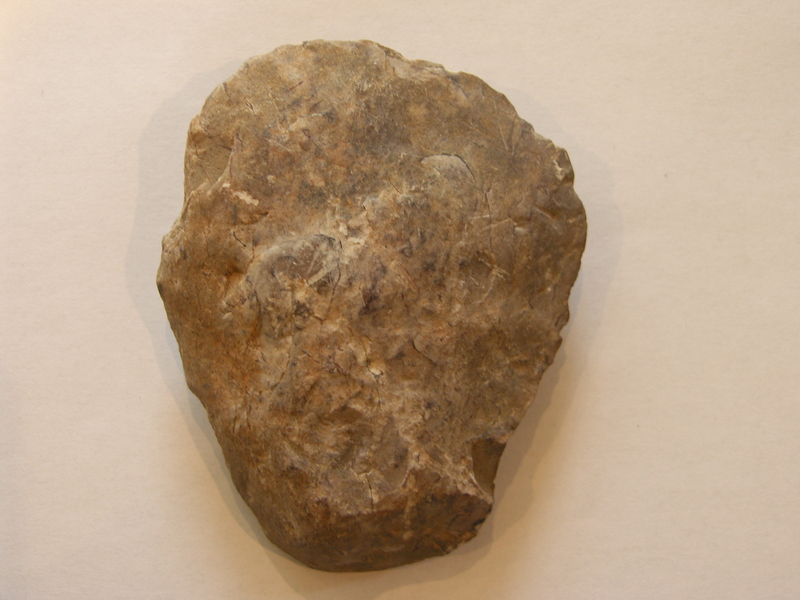 Mooching around one of my postulated Roman enclosure/small fort sites, which lies on alluvium and glacial sand and gravels, up pops this hand axe. 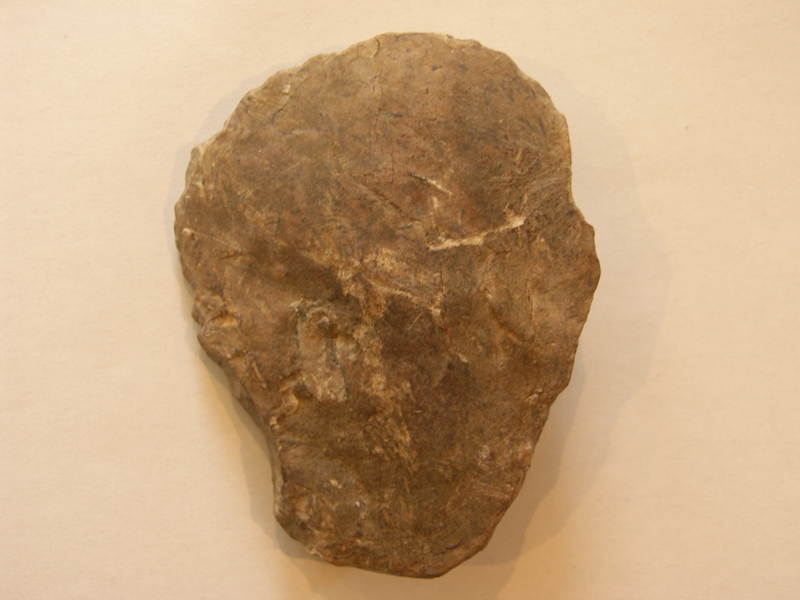 No expert on prehistory but it seems to fit anywhere from the Acheulian 0.5 million years ago, upto the Mousterian, as recently as 40,000 years ago. I’ll leave to others to nail it down. Interesting item, roughly 100mm (4″) x 75mm (3″), and has a edge worked from either side, which has created a rudimentary saw blade effect. Fits beautifully in the hand even to the notch for the thumb to grip it. if anybody is interested in further info or to have a look at the axe, drop me a line. 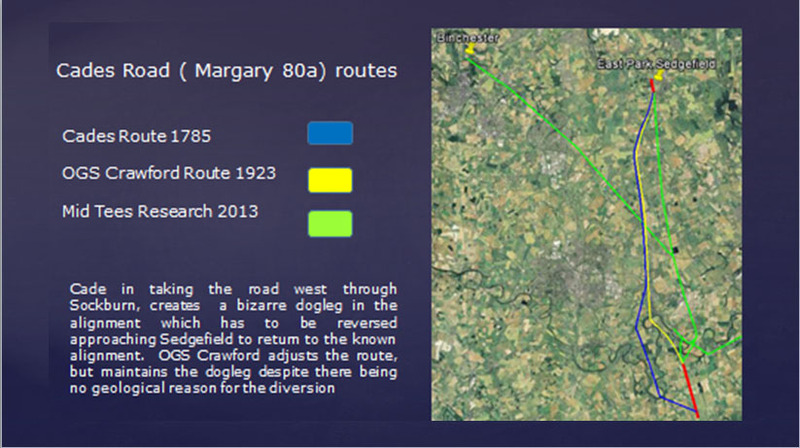 A major part of our project is understanding the significance of Cades Road(Margary 80a), the eastern twin of Dere Street running north/south through the Vale of York. Often in focusing on a defined historical period for research, it is easy to become out of sync with that which went before and after. Most will have heard the urban myth of the A1 being on top of Dere Street on its route through North Yorkshire and Durham, but is that actually true. 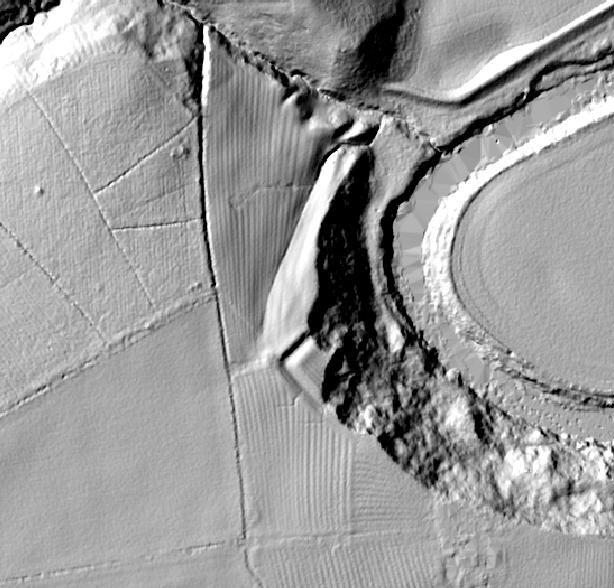 The Roman road Dere street is a Roman military road hugging the eastern side of the Pennines through our research area, transecting the entrances to the upper Yorkshire and Durham Dales. After leaving Catterick on the Swale and passing Scotch Corner the start of the east/west route across the Pennines, Dere St leaves the alignment of the modern A1, and slowly begins its climb to an elevation of upto 260m as it moves increasingly west. The road connects a series of Roman forts in west Durham, Piercebridge on the Tees, Binchester on the Wear, Lanchester on the Browney, Ebchester on the Wear, arriving at the major Roman supply depot at Corbridge on the Tyne, centrally positioned to supply forts on Hadrians Wall both to the west and east. Was it built to create a line of forts, controlling the high Pennines, or to protect a strategic supply route. Perhaps in reality it was a bit of both. It would appear once its military purpose ended in the early 5th century, whilst probably remaining in use as west Durham local road, the next time we see the road as a published route in the medieval period, where it is recorded only as a route to Scotch Corner for access to the east west route across the Pennines. To the north of Scotch Corner,, the focus of medieval settlement is in the productive lowland areas and coastal plains, and the strategic routes followed. On a purely practical level as a strategic route, the course of Dere Street in Durham was always a road to knowhere, once Hadrians Wall went out of use, subject even today to winter inaccesibility, and once north of Hadrians Wall a journey to Scotland would have required navigating across the equally inhospitable and at times inaccessible high Cheviot border country. I would now like to introduce an excellent piece of unpublished research on the Great North Road by Hugh Gillespie. I bumped into his website by accident which has a selection of chapters available online to read. I approached Hugh who kindly provided me with the chapters relating to Yorkshire and Durham, and gave me permission to publish them on the blog. They offer a fascinating insight into the development of the modern road system. Of particular interest to me is the reality that the link between Dere Street the Great North Road and the A 1 is quite recent in historical terms, contrary to what many of us believe, as recently as the 1920’s when the road system was named, the road we know as the A167 Topcliffe to Darlington road through Croft was actually designated the A1 for two years before it was transferred to Leeming Lane which we know today as the A1. Rural Settlement in Roman Yorkshire Conference thoughts!! It has to be stated that the conference was to some degree spoilt by the woeful quality of the PA system which seemed to consist of a couple of speakers from somebodies old HiFi that couldn’t deal with the output of the amplifier, an amplifier that spent most of the day either on the verge of distortion, or doing a Norman Collier impression by clipping the output, fronted by what seemed like an oki koki 3000 microphone nicked from a chidrens karaoke machine with awful frequency response. Most of the speakers were to some degree affected by the quality of the PA, at least one had their talk ruined in my opinion, only the predictably loud Dominic Powlesland abandoned it all together and went vocally commando to do his talk on West Heslerton that replaced the original talk on the Aiskew villa. . Surely it is not beyond the wit of organisations where public speaking is at the core of their function, to either pick a venue with decent sound equipment, or spend a few quid to buy a portable system themselves. 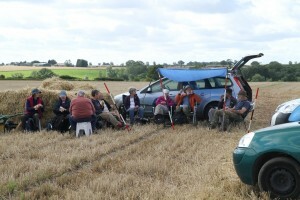 It was encouraging that two of the talks were from amateur groups working in Yorkshire. The Roman Roads project was presented by Mike Haken who came up with some interesting ideas regarding settlement along the major routes, and the Swaledale & Arkenga thdale Archeaology Group(SWAAG) presented an interesting talk on their work in their valley. Steve Sherlock gave a talk on the A1/Catterick road improvements, Steve had that much to talk about that the 30 mins slot was just not enough. Archaeology on another scale! Prof Martin Millet and Dr Peter Halkon both gave their usual professional and interesting talks about their work in East Yorkshire. Dr Pete Wilson gave a talk on behalf of Dr Martyn Allen on data syntheses from the national Roman Rural Settlement project, aimed at collating and analysing developer funded projects since the advent of PPG16 legislation around 1990. Although all of these developer interventions are recorded on the HER, few have been formally published, strangely the cut off point for this work was indicated as being 2004, and seemingly excludes anything that is not developer funded, which in effect makes the work already 11 years out of date, and incomplete. 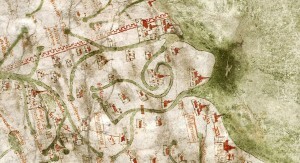 This built in obsolescence was exampled when Pete presented a map of the various types of Roman settlement, where the evidence for the extent of the Roman villa landscape appeared to be that from pre- 1995 with Holme House at Piercebridge being the only ‘villa’ indicated in the Tees Valley. 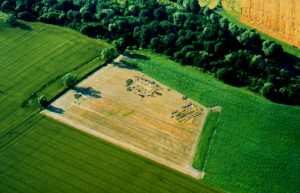 It does question the validity of the research if the Dalton on Tees and Quarry Farm ingleby Barwick villas, both research led investigations, and both on the national monument record since before 2004 are absent. 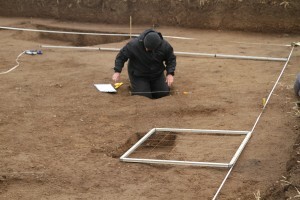 One would presume if you are calling a data synthesis project Roman Rural Settlement, that it would record all Roman Rural Roman settlement , and not just Roman Rural Settlement that conforms to an abstract project design. The key is in the title, Roman+ Rural + Settlement. Interesting conference though also bumped into one of my old tutors Professor Jenny Price. 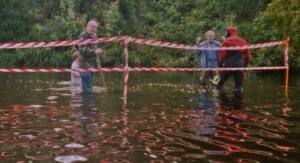 When writing the Cades road background for the Pountey’s Bridge post, I noticed in the image provided for me by Rolfe and Bob, standing in the middle of the river was the person that the archaeological community at the time considered the devil incarnate, to be ridiculed, insulted and generally brushed aside. That man is the late Raymond (Ray) Selkirk, author of the Piercebridge Formula and On The Trail of the Legions. I never met Ray myself, and although we were both looking for missing Rome in the north east in the late 1990’s, Ray was coming to the end of his amateur archaeological career, whilst I was just beginning mine. However if I share anything with Ray Selkirk, it is the same comittment to always challenge the status quo, especially the cosy world of concensus archaeology. So why was this man so reviled by the archaeological establishment? What was his archaeological crime, was he a north eastern equivalent of Erich von Daniken, touting the theory in his book Chariot of the Gods, that God was a spaceman, or was he perhaps the equivalent of those who for religious reasons are committed to the idea that a fossilised Noah’s Ark is sitting on a hillside in modern Turkey. Nope!! 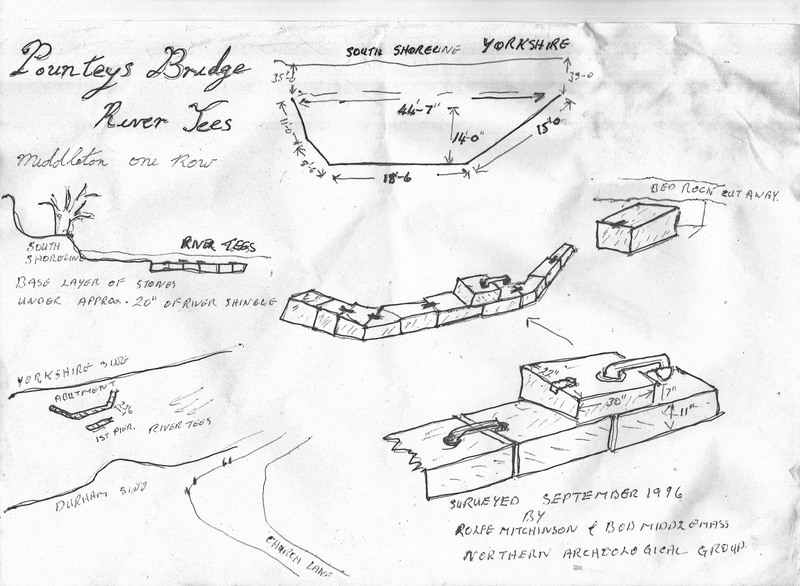 The archaeological community thought Ray was apparently far barmier than that, what Ray actually wrote about in the Piercebridge Formula was the idea that the Romans might have canalised rivers such as the Tees to transport goods upstream to places such as the fort at Piercebridge. Romans building canals? Surely not you might say, what a ridiculous idea, who would use rivers and canals for transport purposes?. Well just about everybody actually! 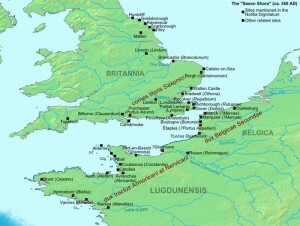 Of course the Romans did build canals, and the Greeks before them, why wouldn’t they, they built huge numbers of them. To suggest that they would not engineer rivers to serve them in Britain if necessary is chutzpah of the highest order, especially from a community that collectively are not exactly known for their engineering prowess. Yet with one or two big names sticking the knife in, most just hunkered down to progress their careers by not making waves, whilst Ray was subject to intellectual evisceration. Of course when it comes to airy fairy waffling on archaeology, the establishment, including the great and the good who today fill our TV screens, take some beating themselves. With their ‘sites of ritual significance’, ‘ processional ways’ , ‘high status buildings’, high status, this, high status that, ritual this, ritual that. Anybody listening to popular archaeology as defined by the establishment would think the whole population through unrecorded and recorded history was composed of middle to upper middle class types, only living in the equivalent of 5 bedroom detached homes with on-suite facilities, spending all their time when they weren’t doing high status things. building churches, walking from one church to another in their best clothes, in between praying, sacrificing, and votively offering all sorts of things. What really was the archaeological crime committed by Ray Selkirk, I would suggest he was on a hiding to nothing by postulating a theory in advance of finding definitive supporting archaeology. The archaeological community in academia can get away with all sorts of theoretical gobbledegook, but an amateur archaeologist does not have that luxury of independent thought, if they expect to be taken seriously. Ray should have known that, and should have tempered his book accordingly, the confidence Ray had in his idea, which is a perfectly logical area of research in my opinion, became in the Piercebridge Formula a statement of fact rather than a theory. 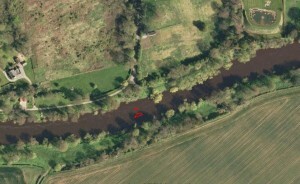 What now for the idea of canalising rivers such as the Tees.? For the archaeological establishment any attempt to revisit the idea will be forever linked with Ray Selkirk and avoided like the plague, probably leaving any future research that might take place to amateur groups. Well I was told there were no villas in the Tees Valley, until we found one, I was told that all the military activity took place through the Dere St corridor, until we found Roman camps and settlements on Cades Road where they weren’t supposed to be. There are apparently no small Roman towns in this area, well watch this space! 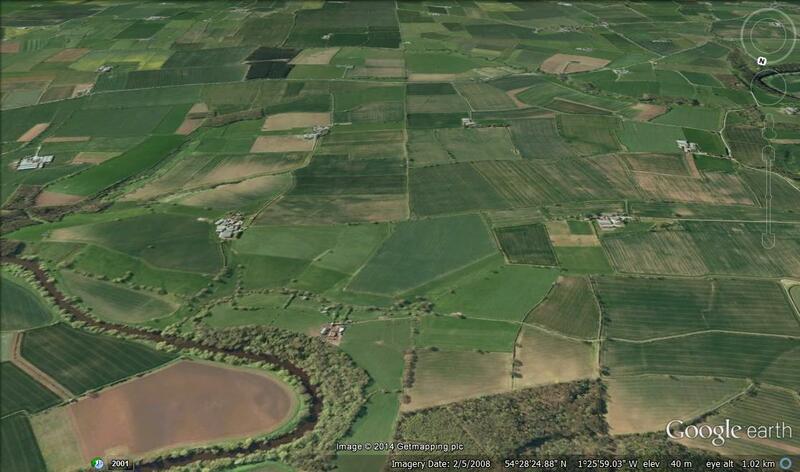 When Ray Selkirk wrote the Piercebridge Formula there was only Piercebridge to support his reasoning, now we have a Roman military and civilian landscape along the Tees, from the villas at Dalton on Tees and Ingleby Barwick, Cades Road at the tidal limit, and adjacent to the tidal limit we now have Roman camps and civilian settlement. Perhaps it is time for the Mid Tees Research Project to revisit Ray Selkirk’s ideas, to bring him in from the cold. Pountey’s Bridge and the Tees crossing point of Cades road is the classic chicken and egg scenario. An enigmatic roman road lost to history needing a crossing point, and a bridge looking for a road to cross it, put the two together, a touch of imagination and everything is a possiblity. Pountey’s is but one manifestation of the name which simply means Pons(bridge) and teys(Tees). Bridge of the Tees. That there was a bridge at Middleton One Row there is no doubt, and a bridge that seems to pre- date the bridges at Yarm built by Bishop Skirlaw in about 1400, and the current bridge at Croft also built in the 15th century to replace the earlier wooden bridge destroyed by floods. The question is what evidence is there for linking Pountey’s bridge to the Roman period as a crossing point of Cades Road(Margary 80a), and when was the link made. Cade’s Road(Margary80a) is named after John Cade of Gainford, an 18th-century antiquarian who in 1785 proposed its existence and possible course from the Humber Estuary northwards to the River Tyne, a distance of about 100 miles (160 km). 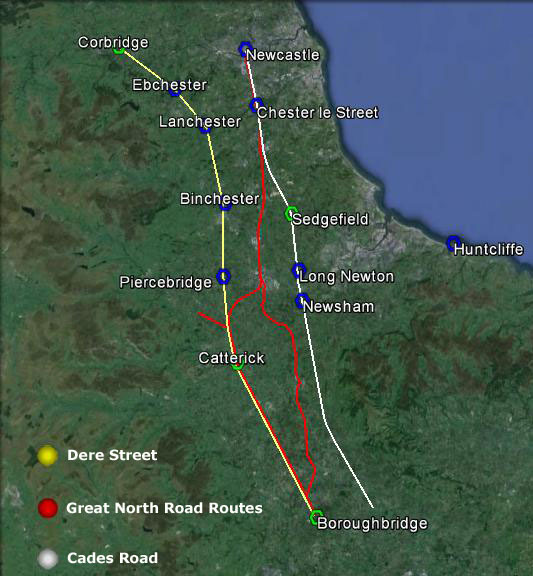 Although evidence exists for such a road on parts of the proposed route, particularly through North Yorkshire, there is considerable doubt regarding its exact course and where it crossed the Tees. The road’s Roman name is unknown, although Cade referred to it as a continuation of Rycknild Street. 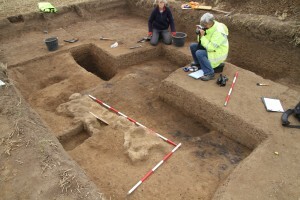 Cades route begins at Brough-on-Humber the site of a ferry, a Roman fort and civilian settlement (Petuaria) alongside a major Celtic settlement. 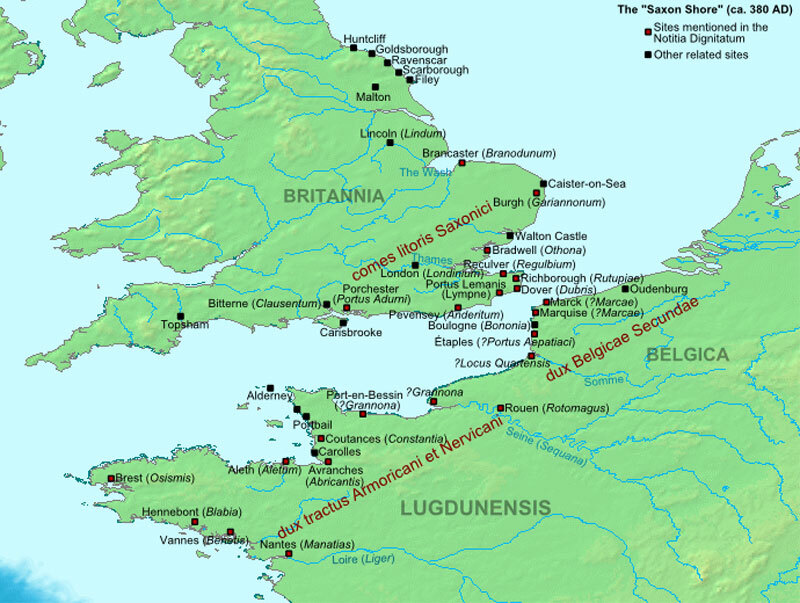 He suggested that it ran northwards through Thorpe le Street and Market Weighton, before gradually turning westwards (possibly following the line of another Roman road) until it reached York (Eboracum). From York it continued northwards, skirting the edge of the Hambleton Hills towards Thornton-le-Street near Thirsk, and then north just to the west of the massif of the North York Moors. Approaching the Tees the 12km extant alignment of hedgelines and country lanes evaporates into thin air just 800m from Fardeanside Ford a crossing point into Newsham in the parish of Egglescliffe one of the principal crossing points of the Tees, even after the building of the road bridges at Croft and Yarm. 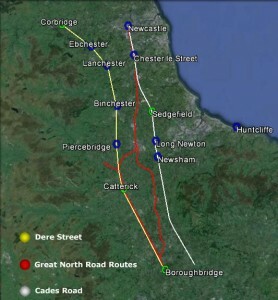 After crossing the Tees Cades route takes the road north to Sedgefield, Durham, Chester le Street, before finally terminating at Newcastle. It is at this point on Cades deliberations, where common sense and logical thinking seem to have left the building, in preference for the if’s, but’s and maybe’s of antiquarian thought. John Cade was a local man from Gainford, and the area along the 100 mile route he knew most intimately was where he was now trying to solve a conundrum. Accepting that he was party to the view that Roman roads were generally straight between given points reflecting the topography of the landscape, logic would have suggested that crossing the adjacent ford, would allow the route to continue in a more or less straight line towards the point where the route becomes evident in the landscape again at Sedgefield. The problem for Cade was that a crossing at the ford was not supported by evidence of archaeology, no Roman camp, no earthworks, and perhaps more importantly no clearly defined straight alignment to the north. Did Cade therfore jump at Pountey’s bridge as his crossing point? Cade didn’t choose Pountey’s because he presumably knew that in 1785, there were numerous mentions of Pountey’s bridge as being medieval, it was not until the 1820’s, that for the first time the bridge is mentioned as Roman. 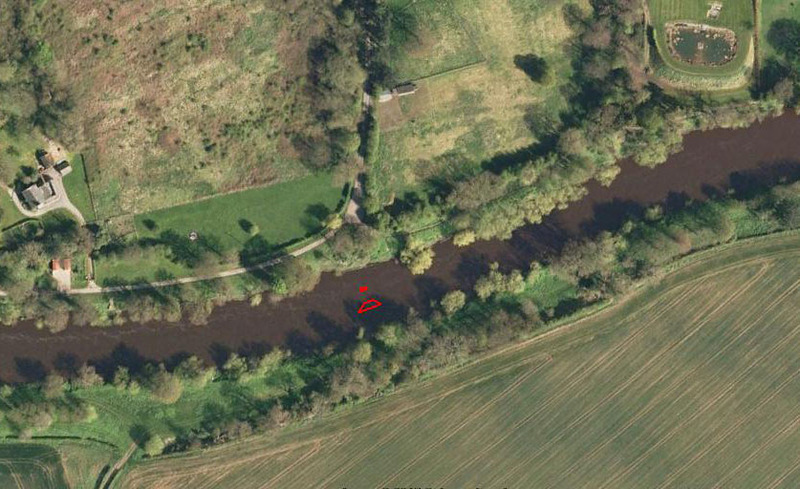 Cade also had another candidate, just 2km to the west in the longest loop of the Tees that extends some 4.5km from the median line of the river south into the North Riding of Yorkshire lay the ancient site of Sockburn(Soccieburg). A defended ancient site by its name elements, the site where all the new Prince Bishops would formally enter the county of Durham, the site of the famous Sockburn Worm legend, an ancient church with Viking hogbacks and Anglo Saxon crossshafts aplenty. Sockburn, together with maps already ancient by 1785 showed a road north out of the peninsula joining with the straight road north to Sadberge at Middleton St George. Cade presumably had enough circumstantial dots in his mind to join them up and neatly extrapolate the site at Sockburn back to the Romans. 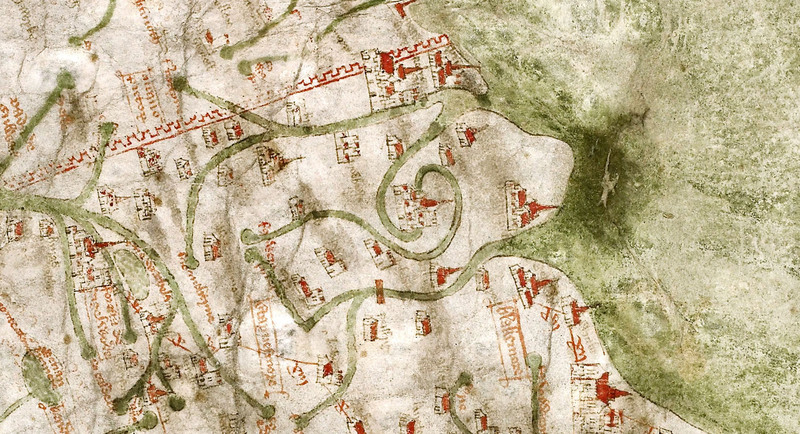 In doing so Cade forced his alignment 2km to the west of its route through North Yorkshire creating a dogleg. A single dogleg is perhaps not a problem, and is common on roman road alignments, the problem for Cade was that as he approached Sedgefield, he had to force the road back to the East by 2km to return to the alignment in East Park. This diversion created a double dogleg, with not a pimple in the landscape to justify it, clearly against all the engineering practices common to the laying out of a roman road alignment. Perhaps we should not be too hard on John Cade, he was after all working without the modern benefits of good maps and aerial photographs., we can perhaps be less generous with those who came later. To anybody considering field research in archaeology, the logic of Cades double dogleg is a perfect archaeological example of putting two and two together and making five. However Cades alignment set the baseline of the alignment, which in major part survives to this day. Cades route was subject to criticism within a few years of him publishing it, but it was nearly 150 years before an alternative alignment at the Tees was suggested by OGS Crawford of the Ordnance Survey. Despite the passing of 250 years since Cade, and despite numerous investigations, no evidence of Rome has been found at Sockburn or Pountey’s or on the alignment upto Sedgefield, apart from a few random finds. 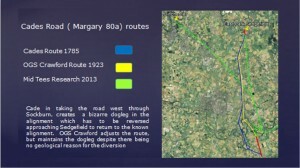 Subsequently Crawfords route, including Pountey’s was adopted wholesale by Margary in his definitive book on Roman roads, but still nobody questioned the bizarre logic of the doglegs, whilst 800m away across a simple ford, hiding in plain view was a Roman military site and settlement on the north side of the river, opposite the confirmed southern alignment, and exactly where logical thinking, topography, strategic value and common sense dictated it should be. As the specialised divers in the amateur Northern Archaeology Group , we led an investigation at the site of Pountey’s Bridge, with the aim of locating any remaining structure, and hopefully dateable artifacts to support the argument that Pountey’s was Roman. Bob and I first got interested in Pountey’s Bridge in early 1991. This was due to the diligence of a Billingham historian called George Preece, who devoted many hours researching the subject. 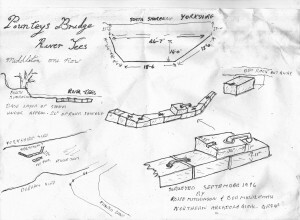 George told us that the bridge foundations were still visible in the river in 1823, and asked if we could locate them. He had already secured permission from the land owner in advance. Our first dive was on the 4th May 1991, when we spent 5 hours searching approximately 100m of river bed. We knew we were in the right area when we found pieces of worked lead, followed by a chisel, then an iron clamp, clamps of this type were used to hold massive bridge stonework together, the lead was then poured in molten solidifying the joint between the iron clamp and the stone. 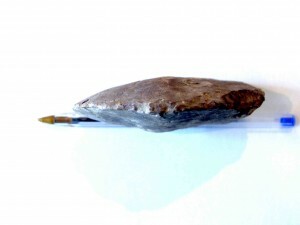 The lead would be chipped out with a chisel when the bridge was being dismantled. Our next dive on the 8th June 1991 produced a second iron clamp, and after digging down 300mm in the gravel bed adjacent to the southern bank, we uncovered the top of a large worked stone. This stone measured 550mm D x 750mm W x 175 mm H. We were happy we had now located the remains of the southern abutment of Pountey’s Bridge, but were pleasantly surprised to discover that there was another layer of clamped foundation stones underneath this single stone. Our next job was to find a pier, so we measured out 8m from the face of the abutment and dug down into the gravel. 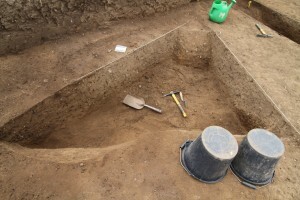 After digging 450mm down, the stonework of the likely pier emerged with quite an area of it still intact. The huge stones like the abutment were held together with iron clamps. Over the next few weeks we completely uncovered the south abutment and found it to be 13.6m wide and 15m deep. 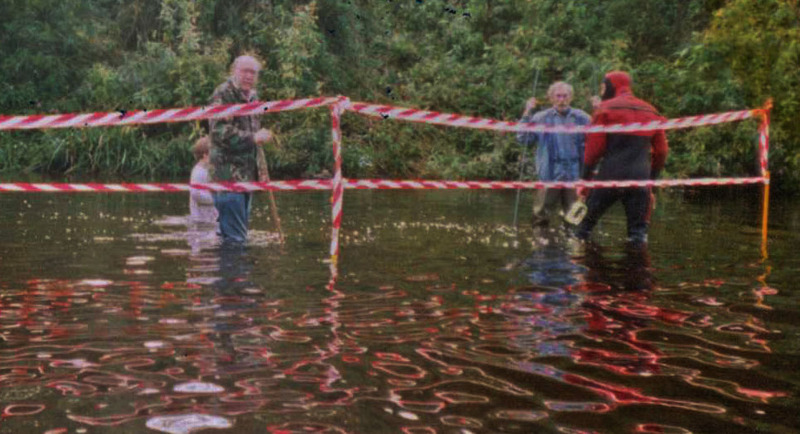 An open day was held in the September 1991, when members of our Northern Archaeology Group and the public, were able to wade across the warm river and observe the foundations, using glass bottom buckets. After the open day, Bob and I reluctantly filled the excavations in and the bridge resumed its long sleep. Bob and I have recovered approximately 5000 Roman coins and artefacts, plus buckets of pottery from the Roman bridge crossing at Piercebridge, in contrast we have not managed to find a single coin, artefact, or shard of pottery at Pountey’s of any period. This absence of material may be more a factor of the deep deposits of river gravels 2-3 metres deep across the Pountey’s crossing site, perhaps in the future investigating down to the the bedrock, the secret past of Pountey’s Bridge will probably be found. 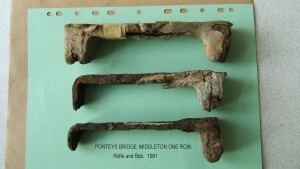 The investigation whilst perhaps not confirming whether the bridge was Roman not, has perhaps provided additional evidence supporting a likely medieval date for the bridge . Traditional Roman masonry construction techniques used in large structures are alternating stretcher courses and header courses, this has the purpose of the header courses extending behind the facing stone, locking the stone face of the structure to the core structure behind, and increasing the stability of the structure as a whole. However the two courses of masonry exposed in the south abutment of Pountey’s are both stretcher courses, there is also the absence of Lewis holes in the stones for location and handling the material, also very unusual though not unknown on a Roman structure. Pountey’s Bridge was a mystery, and to some degree still remains a mystery, although we have perhaps shed some light on the issue. Rolfe Mitchinson & Bob Middlemas. Although this site is principally for research conducted by the Mid Tees Research Project, we are happy to publish other unpublished research by other organisations or individuals. If you have a piece of work gathering dust on your shelves, send us a copy either peer reviewed or not, and we will add it to the archive. It is more important that raw data is made available to other researchers, even if some of the ‘T”s and a few of the ‘I’s remain uncrossed or undotted. With the end of the excavation I will be ending the excavation daily blog or at least the perception of a daily blog. I will however continue the blog and develop the website going forward. 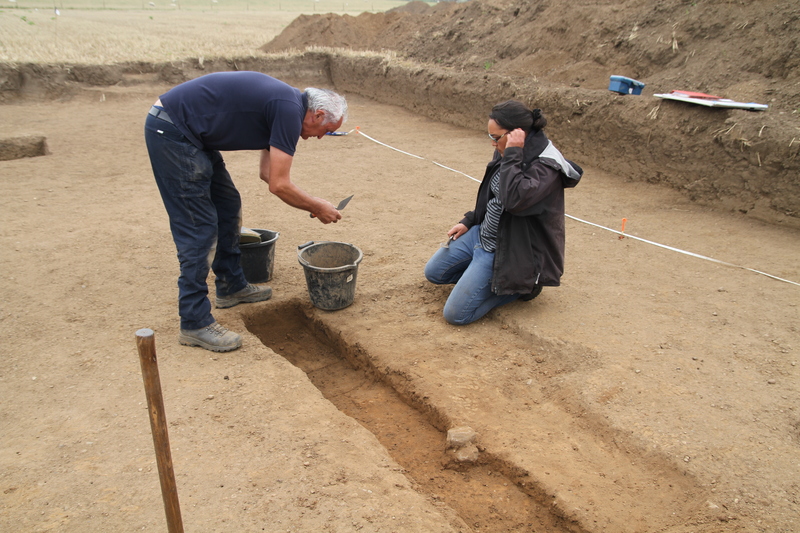 I will also be publishing short interviews with a number of the amateur archaeologists who dug with us, and who kindly consented to being video interviewed during the course of the dig. This project if it is about anything, it is about the people who enthusiastically carry out the work, and it is at the core of the values and ethos of the Mid Tees Research Project that they are not simply shovel monkey’s to be used and discarded at will, but a fundamental and integral part of the project going forward. I want each and every one of them if they so choose, to have the opportunity once suitably skilled and experienced to identify research areas of interest, and to work independently within the project This project was founded by amateur archaeologists and will continue to be a beacon for amateur archaeological opportunity and endeavour. Our sites are not recycled sites that everybody and their dog has talked about until the paint dries, but brand new to archaeology sites adding to the national archaeological story, all found using minimal resources in the best tradition of amateur archaeology, operating with an open mind receptive to all possibilities, exploiting the age old techniques of basic fieldwork, coupled with the embracing of the vast array of open source(free) technology and data, with the occasional quid quo pro arrangement between like minded groups. To end this stage I would like to thank all those who so far have contributed to our success, many of which I will talk about their contribution in more detail going forward. Where would we be without the support of the landowners and farmers. From my first contact with Brian Dale and his family , i have always found an interested and willing supporter of the project, obviously as long as it doesn’t impact on their commercial activities. Brian has been extremely acommodating over recent weeks at his busiest time of the year, and for that we are very grateful. 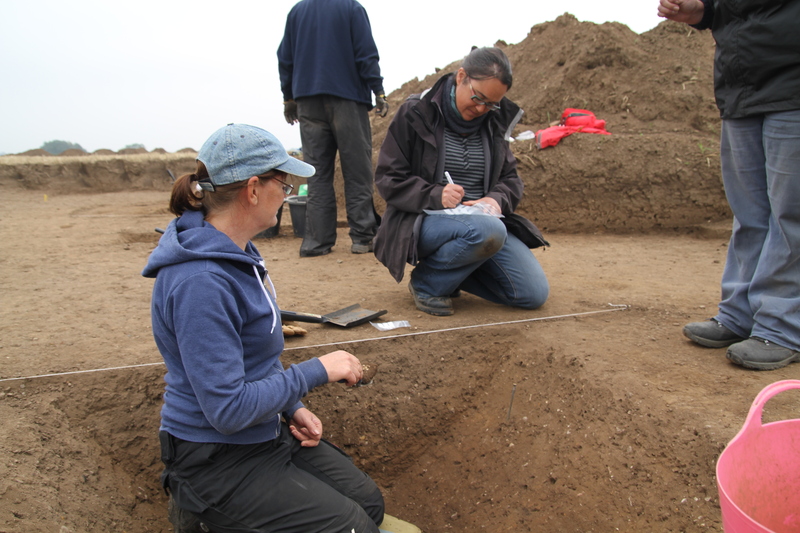 Jenny Parker and Linda Davies hugely experienced amateur archaeologists on other peoples digs, had their baptism of fire in leading on these excavations, and came through in fighting form. Nothing will be quite as intimidating again. 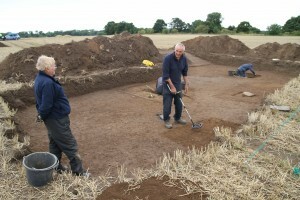 The volunteers: Many thanks to you all, I will be linking the blog to a mailing list shortly, where you will all be informed of the current stage of the post excavation process, it will also be a conduit to inform and advise of up and coming activity. Anthea Ellis from the Jet Coast Development Trust for her kind loan of the magnetometer on a quid pro quo arrangement, where I supported their own geophysical activites and data analysis. Blaise Vyner introduced me to oblique air photography, way back when, and kindly allowed me to accompany him on a number of flights. He was instrumental in providing me with, and pointing me in the direction of likely sites that may be worthy of revisiting, Dalton on Tees being a case in poin. 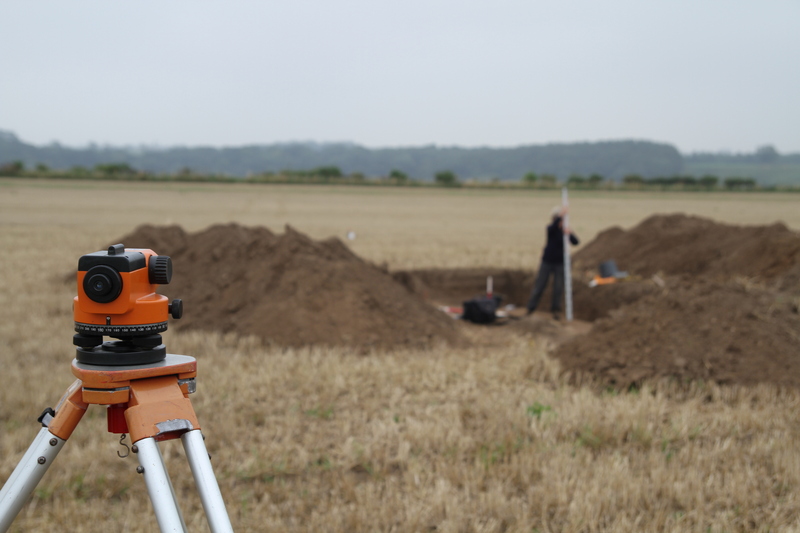 Steve Kaye from Bandaarcgeophysics from his base in the west country has shown a keen interest in the project since I first approached him regarding his data analysis on the likely location of Roman Marching Camps. 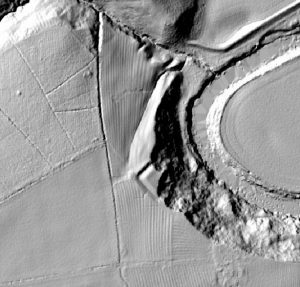 Steve provided the project with enhanced LIdar imagery, advice and analysis, he has published online across a range of subjects. Rachel Graham and Robin Daniels from Tees Archaeology for their logistical support and offer of funding for 2015 from the River Tees Rediscovered Lottery funded project. Day 11 no excavation or not much. The site in the absence of volunteers seems quiet and reflective. Just Jenny, Linda and Rachel to finish off in advance of the digger arriving tommorow to back fill . I have turned up for the morning to hump and dump as required. Tiny bit of excavation today opening up an area in Trench 4 above a couple of strong metal detector signals identified on the day the site was opened. 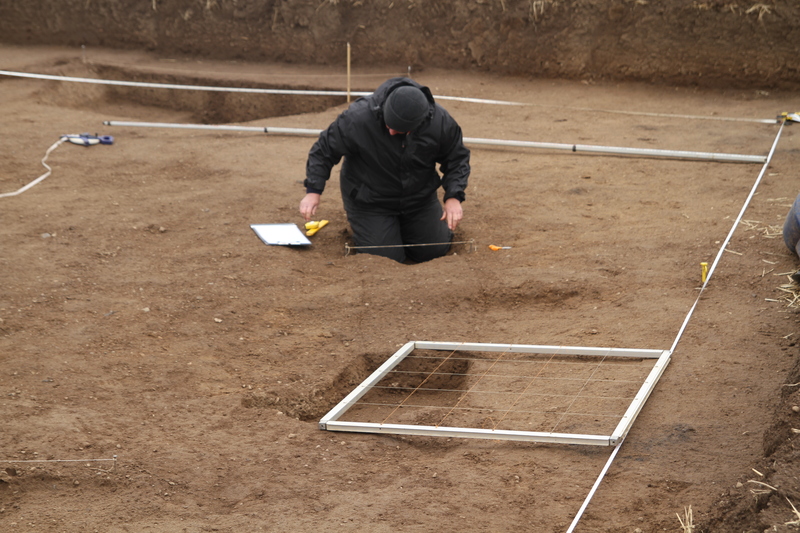 This is another area where after cleaning down of the hard gravelly surface, no archaeological feature was identified, it was therefore assumed it was natural. and that the signals were probably ironstone, Breaking through the hard crust revealed a metal artifact which subsequently turned out to be a large nail. This confirms that most of the archaeology is to a greater degree sealed below this material, a good starting point for our investigations next year. Trench 4 location of large nail. 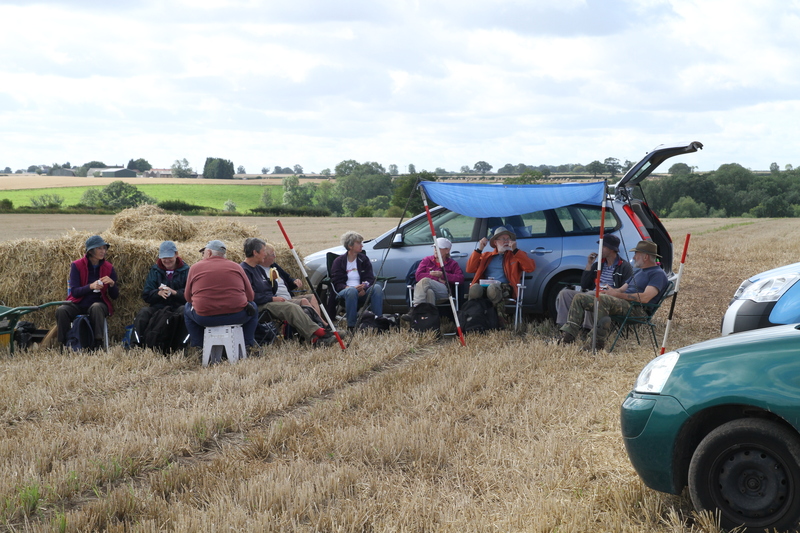 Visit to the site from the members of the local community in Egglescliffe, informal arrangements made with Brian Dale the landowner to give a talk to the Egglescliffe History Group in due course. 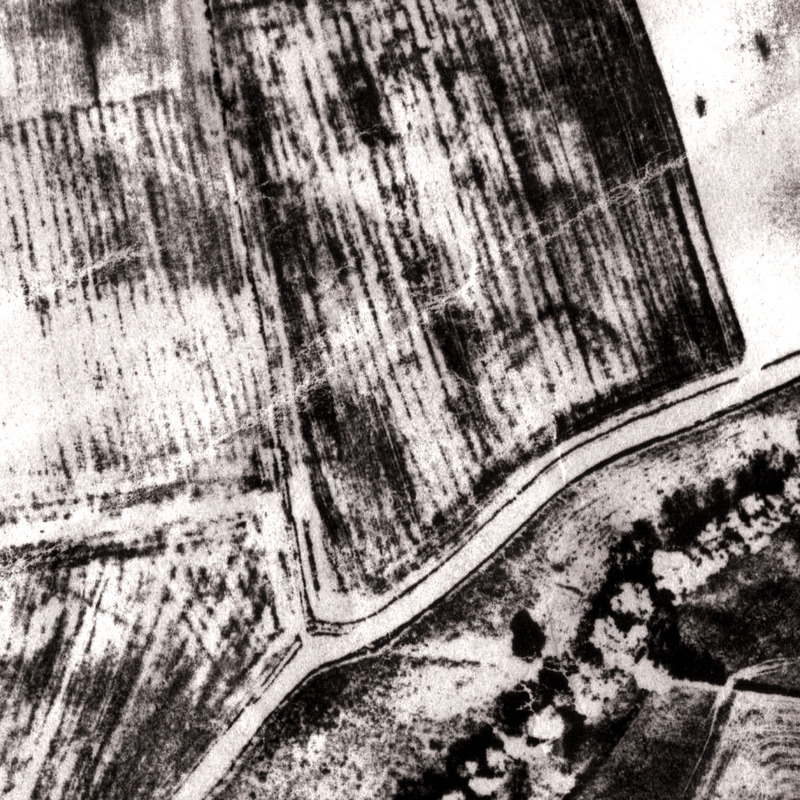 Took the opportunity to extrapolate the line of the north ditch westwards to its return southwards near the scarp edge and outside of the arable area, fixed permanent location markers, offering the project the opportunity to carry out further work if required on the marching camp at any time of the year. Left the site at lunchtime to go and do some real work, leaving the ladies to finish off. Asked for identification of this bird that flew into my car, with no takers all I can assume that archaeology and ornithology are not natural bedfellows. The bird is a Meadow Pippit. 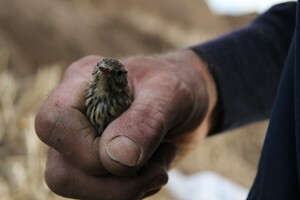 Meadow Pippit in mucky hand.